A wonderful vintage hand blown art glass ashtray from Murano Italy. The clown is quite colorful and holds a ashtary of blue and white spatter encased with clear glass. Stands on two black feet. Measures almost 6" tall and has a width of 5 3/4". Perfect condition with no scratches,chips or damages. 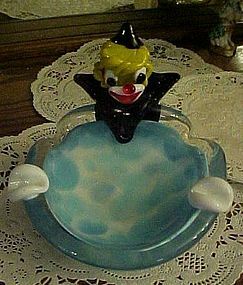 See some of my other vintage art glass clown items I will be listing. 1950's era.